The protected area located in Oruro was established in 1939 and in the place you can enjoy hot springs, observe geysers or climb the highest peak. The Sajama National Park, the oldest protected area in Bolivia, has a great community tourism potential that brings the diversity of its fauna closer together, enjoying thermal waters, observing geysers or climbing the highest peak in Bolivia. 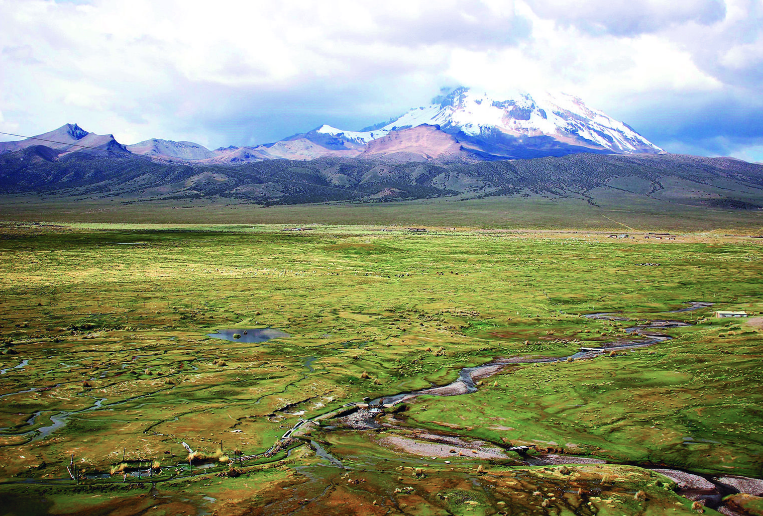 This protected area, established since 1939, is located in the Bolivian department of Oruro approximately 4,300 meters above sea level, bordering Chile in the Andes. The 100 thousand hectares of the park protect the wildlife of animals such as the suri, a species of ñandú from the Andes; the fox and Andean cat, flamingos, pumas and quirquinchos or armadillos. In its paths you can observe without difficulty llamas, alpacas and small groups of vicuñas scattered in the great extensions of a semi-arid and highland landscape, but impressive by the presence of Sajama, the highest snow in Bolivia with 6,542 meters above sea level. In this protected area live five communities committed to the protection of fauna and flora, with its main source of income in tourism. “The communities here live on community tourism, it is the main resource that generates economic returns for education and health,” the director of the protected area, Julio Mamani, told EFE. Several of the communities built shelters to receive tourists, who mainly arrive wanting to reach the top of “Dr. Sajama”, as the residents say. In these eco-lodges the inhabitants take turns attending the guests, who receive with native music so that they know a little of their culture. “We want the people who come here to take home the best memory of our home, the Sajama, and see that we have a lot to offer,” the manager of the Tomarapi community hostel, Martha Guarachi, told EFE. The villagers also offer some of their typical meals based on llama and alpaca meat accompanied by potatoes and quinoa, to taste the flavors of the place. On this occasion, chefs from the Gustu and Jardín de Asia restaurants in La Paz, together with biologists from the Wildlife Conservation Society (WCS), visited the communities at the end of March to learn about the ingredients they use in their kitchens. “We also hope to draw attention to the beauty of these places and also generate opportunities in terms of tourism that benefit the communities,” said the director of WCS, Englishman Robert Wallace. In the same way, these communities offer visits to the Caripe viewpoint, to observe the bofedales, high Andean wetlands, where the alpacas walk free with the majestic Sajama in the background. They also offer to visit a pool with Manasaya hot springs, in the open air, to enjoy the medicinal properties of this water, in addition to which submerging also serves to purify the soul, according to the inhabitants. In the natural reserve, geysers can be observed. 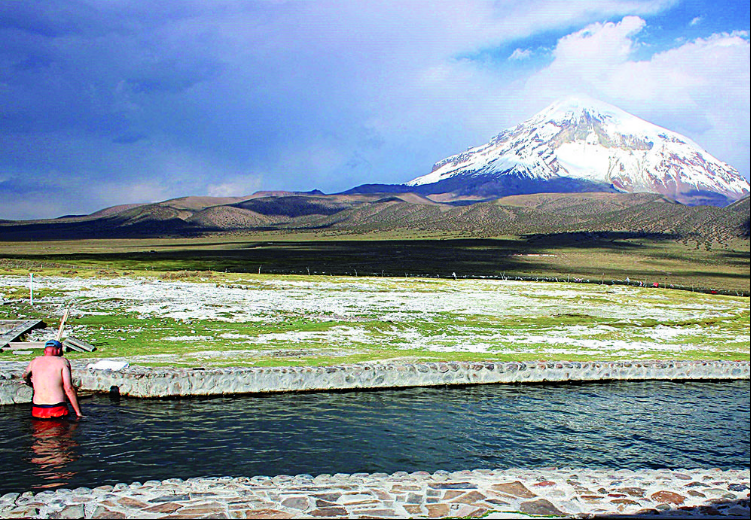 “This place is open to the public all year round and tourists from all over the world come to take a bath in these medicinal waters that are full of minerals, besides taking advantage of taking beautiful pictures with the Sajama behind,” he told Efe Adrián Cañari, legal representative of the place. At dawn, visitors can visit the geysers, eyes of hot water that emanate steam and that rise to different heights. For the more adventurous there are also guides and mountain equipment to climb the Sajama, a volcanic cone covered with snow, or other nearby mountains such as the Parinacota (6,200 meters), the Pomarapi (6,000), on the border between Bolivia and Chile, or the Acotango (6.079). According to Mamani, most visitors come from France, Italy, Spain, Germany and Asian countries, but there are very few from Latin America. Bolivian Thoughts opinion: I visited several times Sajama Park, good road, close to La Paz and it is definitely a must, if you want to understand how the high lands of South America were before human intervention.